A fair and accurate 2020 Census is key to making sure our communities have fair political representation and access to billions in government services. Don't let Trump's Secretary of Commerce leave us uncounted with this nakedly discriminatory rule. Our communities cannot afford another 10 years of political disenfranchisement and cuts to critical services. These are the stakes if Trump’s Secretary of Commerce Wilbur Ross, with the support of Attorney General Jeff Sessions’ anti-immigrant Department of Justice, get a blatantly discriminatory citizenship question added to the 2020 Census. If they are successful, it will ensure that communities of color are severely undercounted in the 2020 Census. Undercounting our communities will make it easy for the GOP to marginalize our voices through racial gerrymandering and make it easy for them to cut funding in our communities for Medicaid, special education grants, children’s health insurance plans, child care and foster care for the next 10 years. Submit a comment directly to the Department of Commerce and demand a fair and accurate census. The discriminatory addition of this citizenship question will cause participation in the upcoming census to plummet. 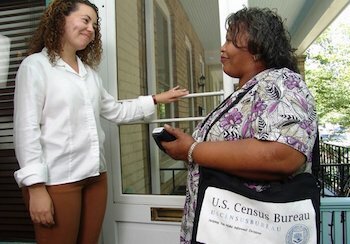 Asking every household and every person in the country about their citizenship status in the current political environment–when there is no programmatic basis or need to do so–will cause hundreds of thousands of people in our communities to avoid the census for fear of being targeted by this administration. Getting the 2020 Census right is important for all of our communities–particularly those most likely to be undercounted. This politically driven citizenship question compromises the Census Bureau’s constitutional responsibility to conduct a fair and accurate count of every person living in the United States. Everyone relies on accurate census data. Census data are the basis for fair political representation and an equal distribution of nearly $800 billion in government services. Local community leaders use this data to make decisions about allocating resources for community needs like education, assistance for veterans, hospitals, and transportation. Businesses and entrepreneurs use census data to make critical decisions about where to locate plants and stores, hiring, and customer needs. We need to send the Department of Commerce a strong, clear message that the 2020 Census must be kept fair and guarantee that no one is left behind. In response to this lawsuit, led by the NY AG’s office, the Justice Department released thousands of documents including internal Census Bureau documents warning that the addition of a citizenship question would depress census response rates, drive up costs, and diminish the accuracy of census data. The documents also included a paper trail that demonstrated that the question was added to further the agenda of white nationalist Steve Bannon and notorious vote suppressor Kansas Secretary of State Kris Kobach. The Trump administration’s efforts to distort and weaponize the 2020 Census is drawing mounting opposition - from both Democrats and Republicans. More than 160 Republican and Democratic mayors, six former directors of the Census Bureau and two former Commerce Secretaries from Republican and Democratic administrations, civil and human rights groups, more than 600 faith leaders, more than 120 of members of the U.S. House of Representatives, and many others representing a diversity of political ideologies and communities coming out against Trump’s plan. They are united in their deep-seated concern that this citizenship question will compromise implementation of the 2020 Census and jeopardize the quality and accuracy of census data for our communities. Together we can generate a groundswell of support to shutdown this blatantly racist hijacking of the Census.